Casey Curtis High Performance Program - Casey runs his very successful high performance training programs right here in Richmond Hill. Casey is best known for being Milos Raonic childhood coach from age 8-17. Milos who lives in Thornhill, learned the game right here in Richmond Hill under the guidance of Casey. When it comes to taking your game to the next level, look no further than the Richmond Hill Lawn Tennis Club and Casey Curtis' High Performance Program. Savanna Ly - 2012 Ontario under 12 singles and doubles champion. Savanna lived up to her #1 seeding at this years Provincials. Keep an eye on this young talent. Liam Draxl and Pavel Badaiants - 2012 Ontario boys under 12 doubles champs. Liam finished 3rd in Ontario. Keep an eye on these two young juniors, you will hear a lot more from them in a few years. Casey Curtis with Maya who flew in from the windy city Chicago to train with Casey this summer. Casey giving the kids a pep talk before they take to the courts in the 35 degree celsius weather. Training that will surely payoff when they get into a long match and have to dig down deep. Mina Vukovic - 2012 Girls under 14 doubles Finalist - If you want to define hard work and dedication, look no further that this young junior. Serves them up, smooth and effortless. 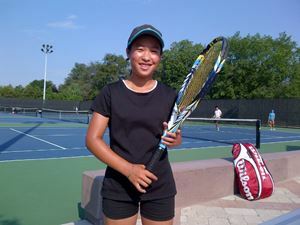 Claudia Poluga - 2012 Ontario under 14 doubles champ. #1 Seed in singles, finished 3rd overall. - plays for the Richmond Hill Lawn Tennis Club. Tegbir Hara - 2012 Ontario Doubles finalist. Comes to Canada from India to train with Casey. "Hands" down one of the craftiest juniors. Plays for the Richmond Hill Lawn Tennis Club. Asad Siyyid - 2012 Ontario doubles finalist - just picked up the game 3 years ago and has shown dramatic strides. Booming serve that speaks for itself and leaves opponents shaking their head.